Great Ice Fishing on Bass Lake! Minnesota Ice Fishing Vacations at Wildwood ResortMinnesota ice fishing is an annual tradition for many. There’s nothing like heading out onto a frozen lake with ice fishing gear in tow. It’s even better in the company of favorite fishing buddies! Many anglers believe fish taste better when pulled through a 12” hole from icy cold water. 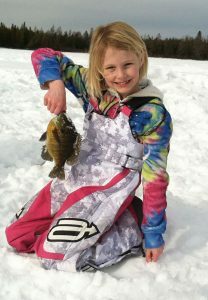 Contact us or call 1-888-328-5858 to plan your next Minnesota ice fishing vacation at Wildwood Resort! The key to successful ice fishing in Minnesota is equal parts skill, luck and patience all tempered by a tolerance of the cold. However, the reward of bringing a walleye or a perch up out of the ice makes all the effort worthwhile. At Wildwood Resort on Bass Lake the seasonal freeze-over begins in mid-November with ice-fishing season stretching from early-to-mid December thru early March. Ice anglers looking for variety will find literally hundreds of great ice fishing lakes within a short drive of our MN resort. Bass Lake is well-known as a panfish lake, with plenty of sunfish, bluegill, crappie and perch ready for the taking. Most of our ice fishing resort guests, travel less than a mile to the favored fishing spot on our end of Bass Lake. 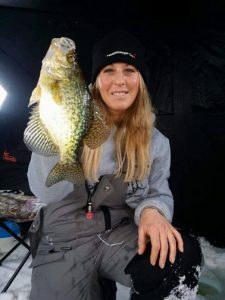 However, with 2,400 acres of prime MN ice fishing waters available anglers looking for walleye and northern pike don’t have to travel far to find the deep, dark waters they need for fishing or spearing. Additionally, our proximity to Lake Winnibigoshish, Bowstring Lake, Jessie Lake and North Star Lake make it easy for lake hoppers looking for jumbo perch or muskie to find fresh ice fishing waters nearby! Ice fishing rods and other gear are available at local retailers. Fishing rods for ice fishing can be purchased through local retailers. The rods tend to be shorter, and if fishing in shallow water you’ll be fine with the typical rod and reel. However, since you’ll often fish deeper than 10-15 feet, you’ll might want to use a tip-up, which helps to alert you when you’ve caught something. We suggest you stick with smaller baits and lures. You will also need a hand or gas-powered auger for drilling holes in the ice. 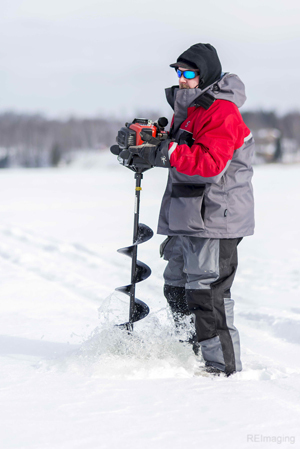 Since ice often reaches depths greater than 3 feet we suggest a gas-powered auger! (Remember to keep your blades sharp.) Also on the shopping list: strainer to scoop the ice shavings from the holes, foam or insulated bait bucket, ice picks for safety if you should fall in, bait, and a stool or large bucket to sit on. Many folks find that a portable ice fishing house makes your Minnesota fishing adventure much more comfortable since it helps shelter you from the wind and the cold temperatures of winter. Oh! And don’t forget to pick up a copy of the Minnesota Fishing Regulations! Or go to the Minnesota DNR website for information about regulations, seasons and licenses. You can even download them to your smartphone! Local outfitters like L&M Fleet Supply, Glen’s Army Navy Store and Ben’s Bait in Grand Rapids; River Rat Bait and Thousand Lakes Sporting Goods in Cohasset; or Fred’s Bait in Deer River have helpful and knowledgeable staff who will help with your equipment needs. When you venture out onto any lake in the winter, safety should be foremost in your mind. The DNR has guidelines for ice safety and recommends 4 inches of ice for foot traffic and 12-15 inches a medium-sized truck. Wear a life jacket and throw some ice picks around your neck. If you are ice fishing alone make sure that you have a cell phone. Dress in layers for warmth since you will be sitting on the ice and generally won’t be moving around much to keep warm. We suggest you wear long underwear, a flannel or wool shirt and a good winter jacket and snow pants or bibs. Many ice anglers bring a spare pair of warm gloves since they can tend to get damp in a hurry. A pair of foot spikes to provide traction are also helpful when there isn’t much snow on top of the ice. That’s it! 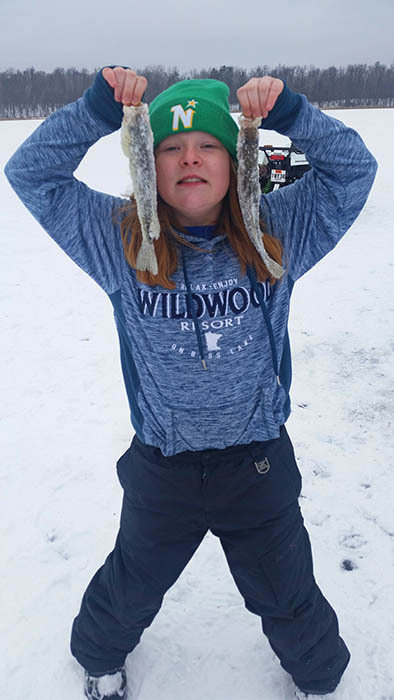 You’re now ready to go ice fishing in Minnesota at Wildwood Resort. All you have left to worry about is how you’re going to prepare your fish for dinner. Minnesota anglers should be aware of annual changes in fishing regulations and special limits that may apply to the lake on which you are fishing. Spend time acquainting yourself with rules and limits on the Minnesota DNR’s website or download the Minnesota Fishing Regulations. While on or fishing waters with size restrictions, all fish for which the size restriction applies must have their heads, tails, fins and skin intact and be measurable except when a person is preparing and using such fish for a meal. When packing fish, labels identifying the fish must include the name of the lake where the fish was caught and the size of each of the fish that are regulated under a special size limit.